Nine people have been displaced after a fire forced them from a triple-decker home in Lynn, Massachusetts. 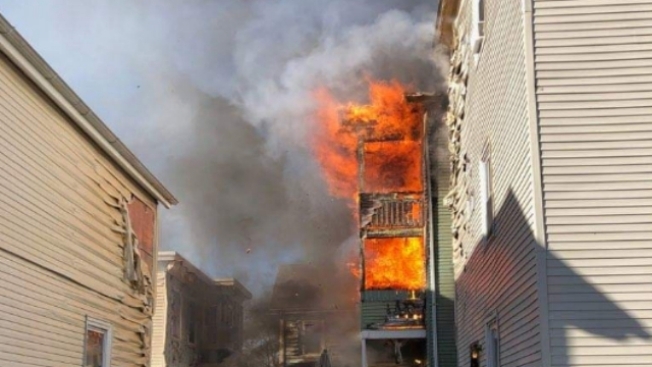 An off-duty firefighter from a neighboring community is being credited with helping to rescue residents from a burning home in Lynn, Massachusetts on Wednesday morning. The fire was reported at 56 Essex St. around 9:15 a.m.
Nahant firefighter Robert Barreda, who was off-duty at the time, was driving down Essex Street when he noticed the fire. He stopped his vehicle, called 911 and then entered the burning building to evacuate the residents. Fire officials all six adults and seven children who live in the 3-story building all escaped safely. No injuries were reported. Nahant Fire Chief Michael Feinberg issued a statement commending Barreda "for his lifesaving actions." Neighbor Jack Fenton also rushed to the scene to help get his neighbors out of harm's way. "I yelled at my wife to call police and she had said to go up and try and get the people out of the house, so I did," recalled Fenton. "It was fast. It was really fast." Patty LeBaron, whose daughter escaped the fire, said there is nothing left in her apartment. "She just lost everything they had there... there's nothing left," LeBaron said. "My son-in-law opened the back door and the flames just came flying in, he said." The fire was declared under control shortly before 11 a.m. The heat from the fire melted the siding of other buildings nearby, according to Lynn Fire Chief Stephen Archer. The exact cause of the fire is still under investigation but authorities are looking at the second floor of the building. Residents who live on either side of the building who also suffered damage have been allowed back inside their homes.